Plant it anywhere full sun to full shade and it will thrive. Forget to water it, it will forgive you. These shrubs grow in a mounded shape and make wonderful accent plants, privacy plants or hedges. They're also useful in hiding the "unmentionables" like the air-conditioner or those funky above-ground drainage pipes that can spoil the look of a front yard. The umbrella-like leaflets generally cover up any cut points so the plant always looks good. The green variety grows fast, more rapidly than the popular variegated one. It can be kept 4 to 6 feet tall. 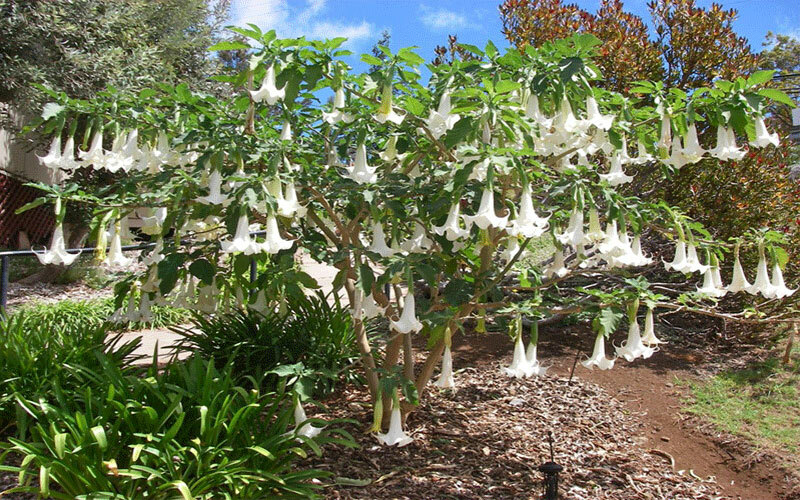 The best growth for Angel Trumpet occurs in acidic soil, though it can tolerate alkaline well. It does not tolerate salt well, and is not drought resistant. 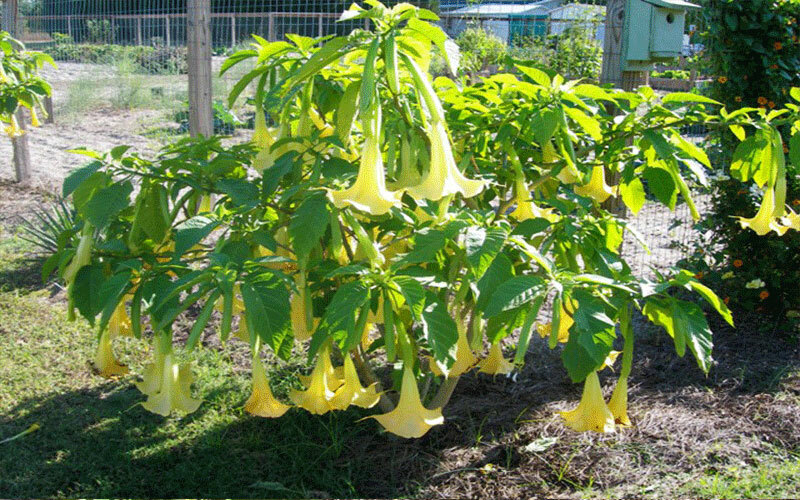 Angel's trumpet should be fertilized at least once a week. Large plants can be fertilized 2-3 times a week. Do not use slow-release fertilizers since these will not work fast enough. Use a water soluble fertilizer such as Miracle Gro. This is a very thirsty plant. It needs to be watered well and often. If in a pot, make sure there is enough drainage so it doesn't get water logged. As long as the soil appears wet and there is no wilting, the plant is fine. Propagation is through seeds and cuttings. 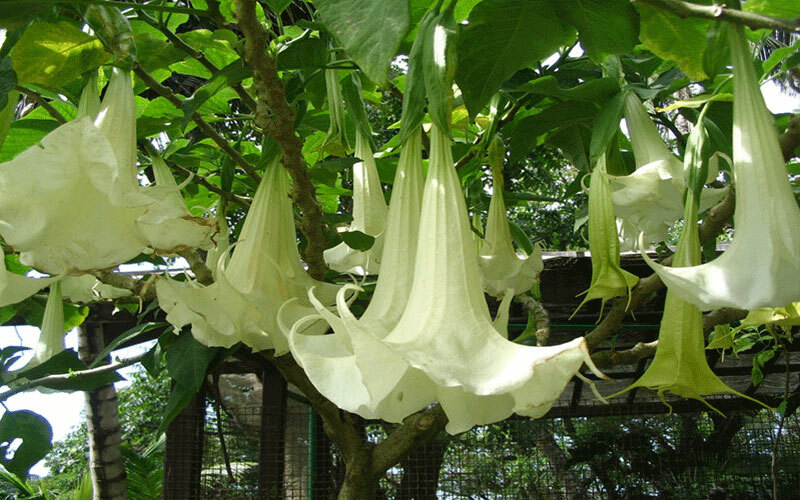 The Brugmansia Growers International advises: "The best time to trim your plant is in the fall. Always keep at least 6-10 nodes on the branches above the Y for flowers the following year. It is the branches that are above the Y which will produce next year's flowers." You don't really need to prune angel's trumpet at all unless it is getting in the way.